You may remember that last year I was a brand ambassador for Best Buy. It was a great experience and I'm grateful to have had the opportunity. Last week I was honored to speak on a panel for Best Buy's LatIN Employee Business Network. The program is one of the company's groups that promote diversity and inclusion. LatIN has recently fired up to become a resource for Best Buy Latino employees that helps them with their personal and professional development. I had the chance to have lunch with two of LatIN's committee chairs. I found them to be full of youthful energy and enthusiasm for their EBN and eager to develop programs that give back to the Latino community. 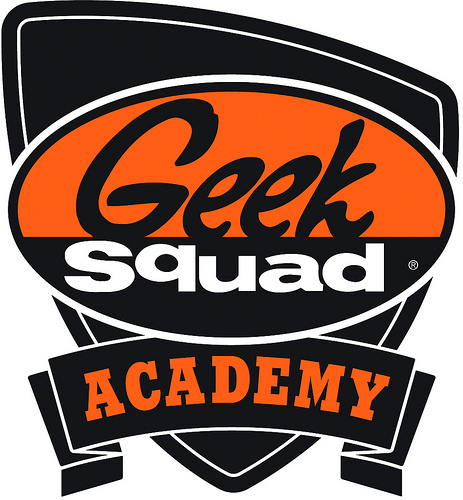 One of them - Brittani Uribe- actually works with Geek Squad Academy, which brings summer camps to at-risk children ages 9 to 18 in over 70 cities across the nation FOR FREE. 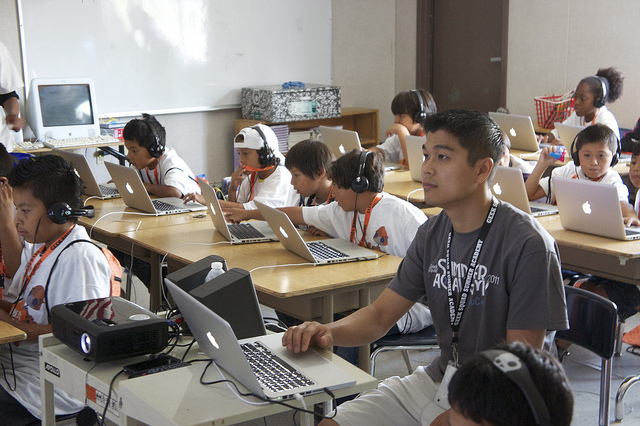 The two-day camp curriculum covers a wide variety of subjects, including PC repair, robotics, digital literacy, online safety, digital video editing, and even basic programming. In fact, they are currently accepting applications for their 2015 summer programming. If you are interested in hosting a camp in your community, you can apply here. There must be a minimum of 100 students (maximum 200) who will participate in the two-day camp. Brittani was actually one of the first Academy students served in Houston back when the program officially launched. But the LatIN EBN is also making a difference in the lives of students in their local communities outside of official programs like Geek Squad Academy. In fact, Brittani and Andrew told me about how they recently helped to help convert 700 iPads from English to Spanish at a Spanish immersion K-5 school in Minnesota. The iPads are assigned to each student but remain on school grounds to be used during class time. And children aren't the only ones benefitting from LatIN's community outreach. They also have an after-hours program for Latino health that provides classes for recent immigrants to help make the transition easier for them. The panel that I participated in was designed to encourage and inspire both Latino and non-Latino employees and management. The other panelists consisted of Best Buy employees; all of them Latino, but with diverse backgrounds such as Peru and Mexico. The moderator asked about the benefits and challenges of being bicultural and bilingual, and how we bring our whole selves to work each day. I wonder how many Latinos in this country understand their value? Do we realize how important our bicultural experiences are to our success? With Latinos over-indexing in technology and social media, it came as no surprise to learn that some of Best Buy's most successful stores are actually found in Latino communities in Florida and California. So I'm hopeful that the company realizes that NOW is the time to recruit Latino youth who are already tech savvy and can successfully communicate with and educate our community. I hope they continue to support their Latino employees, which are an invaluable asset, and that they also invest in our communities because by doing so, they benefit not just Best Buy, but our nation as a whole. The Millenial generation is set to advance. Studies show that Latinos are more likely to start a business than the general market, and they are more likely to successfully grow a business. In today's world, that isn't possible without the use of technology and our youth only need a little more education and guidance in this area to blossom. I am hopeful that companies like Best Buy will see the opportunities we provide and help us succeed so that our entire nation might benefit. Disclosure: I was compensated for speaking on the LatIN panel. All thoughts and opinions are strictly my own.